Being able to access internal applications from anywhere in the world and from any type of terminal has become an essential need. In this regard, standard "VPN" type solutions are essential but they only cover part of the needs. 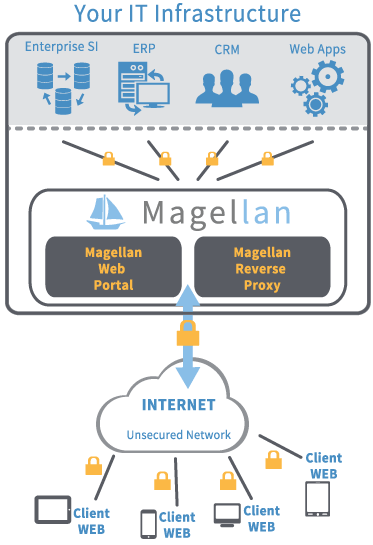 Magellan is an "extranet"-type web application which allows its users to connect simply and securely using your company's in-house applications through a web browser. It does not require any software to be installed by the user and can be used from any type of terminal (fixed or mobile) and using any type of operating system. It can be used with any standard web application, but also with applications based on modern HTML5 and WebSocket technologies which, for example, enable RDP (Windows Remote Desktop Protocol) connections, BNC connections, SSH connections, VoIP (SIP), etc. to be managed. Standard encryption such as SSL/TLS is used in order to ensure the confidentiality of the data transmitted under all circumstances. The application can be used safely from several access points, such as public access locations, Internet cafes, etc. It also benefits from various internal monitoring and protection mechanisms, the aim of which is to detect various forms of cybercrime and to defend against it. Access to the applications and the various authentication methods based on the user's membership of groups. It is easily possible to define the list of applications from which a user may benefit, and by which means. The management of new applications and authentication methods (offered through the access portal) is totally automated, with everything being plug-and-play and managed by the application itself. Magellan is completely plug-and-play. Its intuitive administration interface enables simple and efficient management of authentication modules. Generic management of new applications and authentication methods, Modular application with new authentication modules developed to order, Use of a website which enables its interaction with all types of applications. When entering a session, the user must go through several authentication stages imposed by your IT department (defined globally or on a case-by-case basis). These authentication stages are generally composed of authentication by password (e.g. LDAP/Active Directory), followed by an OTP (one-time password). The application is meant to be generic and scalable, thus enabling an unlimited number of authentication factors. Access your business applications where you are, no matter what hardware is used to access the Internet. 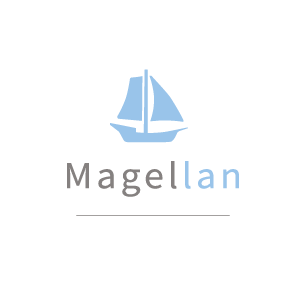 The Magellan solution can be used with any standard web application, but also with applications based on modern HTML5 and WebSocket technologies. It enables, for example, RDP (Windows Remote Desktop Protocol) connections, VNC connections, SSH connections and VoIP (SIP) to be managed through your web browser. Using multiple-factor authentication (OTP – One-Time Password), the solution ensures you have optimum security. You can choose between different multiple-factor authentication methods.